With the dust just beginning to settle at Twin Ring Motegi, we cross the globe to the Ladera Test Track. With it's narrow, twisting lines, Ladera tests not just the limits of racing cars, but also the limits of a driver's concentration and patience. After dominating performances by the winners of both classes at Motegi, the question being asked at Ladera isn't who will dominate? The question is, who will survive? Each segment will be 20 laps. I should make it to this one, my schedule is open for Wednesday. 2 races of 24 laps? One 4 lap qualifying session and 2 20 lap races. Races should be 20-25 minutes each. I'm not sure I'll make this first one. This time will typically be good for me, but today might be pushing it. A lot going on. Is it possible to show up late and just race the second heat? At least so I can get some time in? If not, that's OK too. I can wait until next week. I wouldn't mind starting last of course. And I like the paint on the car. Thanks! I think is allowed to show up only for the race 2. As Manuel said, you are welcome to join us for the second round. Oooooh, that might be doable. If I get on around 6:30 that should be enough time, eh? I'll see if I can make that. Fingers crossed. Or I should say, "God willing". 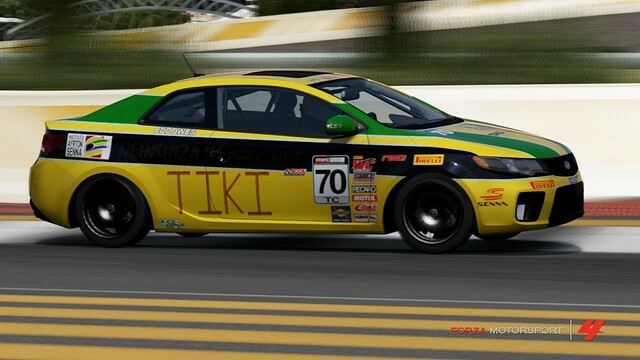 Good racing boys, first win in TC for Team TIKI and we get 2 double podiums. Think i lucked in on the misfortune of others a bit, particularly race 1. But i'll take it! I think the two chevy boys tonight were missing there camaros and corvettes! 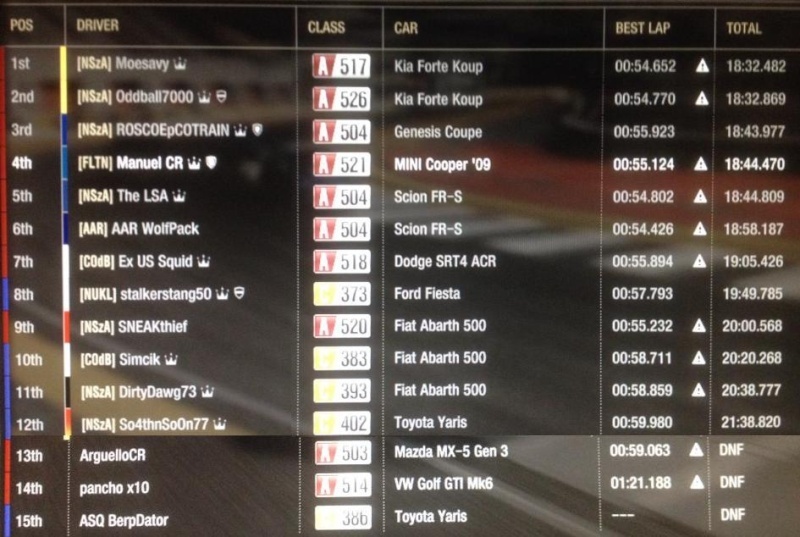 race 1 was just a not good race for me overall haha caught traffic in the place my car made speed and about stopped xD then something went curflewy with my internet/lobby and i counted down to the moment of lag impact and BAM!. 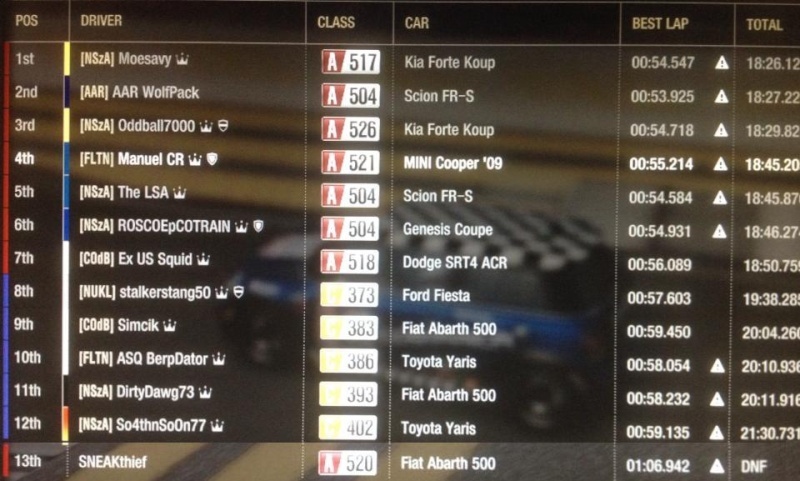 Originally thought we lined up like GTS but I was wrong, started 6th, lagged out. Restarted 8th and drove up to oddball but the car was sooooo loose under braking that I couldn't charge the corner and eventually passed out on the outside when i got a gap. About drove up to moss bumper within 150 feet but ran out of time. Good job tonight to the tiki team! I was trying my hardest to get up to you, woulda been a challenge to pass nonetheless. Woulda been a good fight there sir! Also would like to thank NAPA for coming or board to put a new brand on the hood! Thanks Manuel. I missed grabbing the Qualifying results. Once I have a chance to watch the replay I'll get the points updated. Standings and results are posted in THIS thread. That looks like fun and great pics!!! I hope I can make it next week.